Despite the rampant corruption of his administration and his many other faults, Hamid Karzai was a consistent critic of US-led night raids that led to many senseless civilian deaths, disappearances and torture. Those raids, and the US death squads that carried them out, were right at the top of the list of reasons Karzai refused to sign the BSA authorizing the continued presence of US troops in Afghanistan beyond the beginning of this year. Now that Ashraf Ghani has signed the BSA, the US has retained its right to “counterterrorism operations”, meaning that US-led night raids are still authorized despite Barack Obama’s declaration that combat operations have ended (while relying on a semantic sleight of hand in omitting that counterterrorism operations continue). Khaama Press article on Ghani’s move to institute night raids. The Afghan national security forces were instructed to take all necessary measures to respect the Islamic values, the Afghan culture, Afghan constitution and other laws of the country while executing a special military operation. It’s hard to see how that instruction can be carried out, though, since the ANSF have been trained by US forces whose actions led to those very charges against them by Karzai. Even though Karzai forced the US to sign an “agreement” supposedly reforming US night raids in 2012, Karzai was still complaining about the US violating Afghan homes more than a year and a half later. Ghani is now authorizing these crimes to be committed by Afghan troops as well as US troops. On a separate front, a number of Afghan Members of Parliament have declared that the failure of the Unity Government led by Ghani to establish a cabinet more than three months after assuming power rises to the level of a charge of treason. 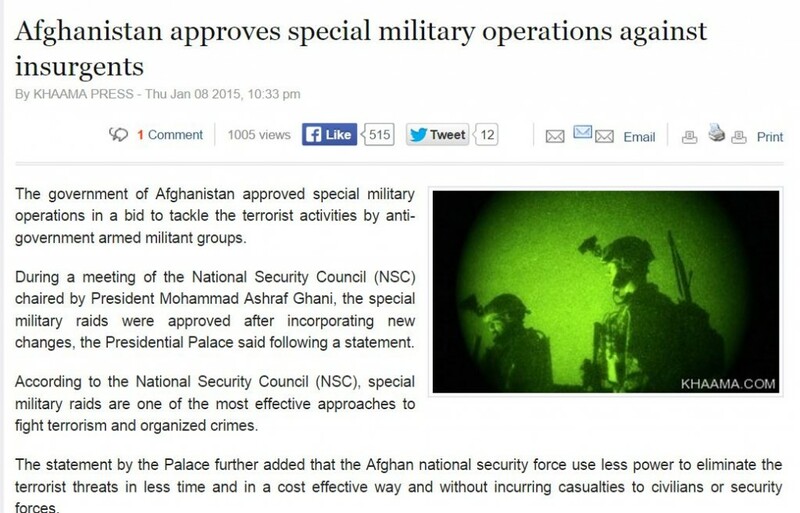 Ghani, however, appears to be shrugging off the charge. With the idea of impeachment already in the air, Ghani’s move to institute night raids by Afghan forces might just provide a stronger basis for moving ahead with charges. Barack Obama faces a huge amount of pressure during the current meltdown of Iraq because he withdrew all US military forces from the country. As I have pointed out in countless posts, the single controlling factor for that withdrawal was that Iraq refused to provide criminal immunity to US troops who remained in Iraq past December 31, 2011. A very similar scenario is playing out now in Afghanistan. Hamid Karzai has refused to sign the Bilateral Security Agreement that will provide criminal immunity to US troops remaining beyond the end of this year. Both Abdullah Abdullah and Ashraf Ghani have stated that they will sign the BSA immediately upon taking office, but the recount of their runoff election remains mired in dysfunction over how to eliminate fraudulent votes. John Kerry has visited twice to get the candidates to cease sparring, but dysfunction has quickly ensued after both visits. Meanwhile, the clock ticks ever closer to expiration of the current agreement providing immunity. All along, the US framing for insisting on criminal immunity for troops is based on avoiding the chaos of soldiers facing false charges that might be brought through a court system that lacks the safeguards of the US court system or even the US military courts. But a report (pdf) released Friday by Amnesty International provides solid evidence that the US has failed, on multiple verified occasions, to take any action to pursue those responsible for clear war crimes in Afghanistan. That stands out to me as the real reason the US insists on criminal immunity. Focusing primarily on air strikes and night raids carried out by US forces, including Special Operations Forces, Left in the Dark finds that even apparent war crimes have gone uninvestigated and unpunished. Yeah, I’m sure the military will get right on that. Sometime in the next century or two.  Create a credible, independent mechanism to monitor, investigate and report publicly on civilian deaths and injuries caused by the ANSF, and to ensure timely and effective remedies. This mechanism should include detailed procedures for recording casualties, receiving claims, conducting investigations, carrying out disciplinary measures including prosecutions where warranted, and ensuring reparation, including restitution, compensation, and rehabilitation.  Ensure that accountability for civilian casualties is guaranteed in any future bilateral security agreements signed with NATO and the United States, including by requiring that international forces provide a regular accounting of any incidents of civilian casualties, the results of investigations into such incidents, and the progress of any related prosecutions. Such agreements should exclude any provision that might infringe upon Afghanistan’s obligations under the Rome Statute of the International Criminal Court.  Continue to press the US and NATO authorities to take meaningful steps to enhance civilian protection, investigate reports of civilian casualties, and prosecute violations of international humanitarian law that result in civilian casualties. Those recommendations are terrific, but they are completely meaningless when applied to what is really happening in Afghanistan. None of the good things in that list have any chance of even making it into the language of the already negotiated BSA, and even if they did, no enforcement of it would ever be allowed. After all, the US is the country that even has passed a law allowing use of military force to “rescue” any citizen facing charges in the ICC. It doesn’t matter whether George W. Bush or Barack Obama is the Commander in Chief, the US military will go wherever it wants, kill whoever it wants, and allow the vast majority of its crimes to go without consequence. That is the particular freedom they hate us for. I’m wishing that I had started a spreadsheet a couple of years ago to track the various deadlines the US has issued for having a signed Bilateral Security Agreement in hand. Such an agreement would authorize US troops to remain in Afghanistan with criminal immunity after the current agreement expires at the end of this year. Just a search of the tag “Bilateral Security Agreement” brings back three pages of posts on the topic at Emptywheel. Early in the process, the US position was that the mental giants in our military needed a full year to plan whether or not we were withdrawing completely, and so a signed BSA had to be in hand by the beginning of 2014. Then, after Karzai defied the loya jirga and stated that he would not sign the agreement while in office, the US pinned its hopes on the presidential elections, since the two leading candidates both stated they would sign the agreement immediately upon winning. There was the unrealistic hope that a clear winner would emerge from the first round of voting in April, but that did not come to pass. The runoff was originally slated for May 28, then moved to June 7 and finally took place June 14. But when the preliminary results of the runoff showed Abdullah moving from beating Ghani by a million votes in the first round to losing to him by a million votes in the runoff, the problems with counting votes in Afghanistan have moved to the center of the ongoing crisis. The crisis shows no prospect of abating. Even though Kerry brokered an extra-constitutional “unity government” agreement between Abdullah and Ghani (and there has even been a nebulous conference on the new structure), the dim prospects for these two actually sharing power can be seen in how long the arguments over how to audit the runoff votes has carried on. We have had countless pronouncements out of Kabul that the snail’s pace of the audit will accelerate any day now, once the two sides agree on the procedure. The UN finally put forward its own proposal for a procedure yesterday since the candidates could not agree on one. Further disruptions in the audit will come next week as two more days will be lost to Eid. With thousands of ballot boxes still to be audited, there is no way that an official final tally will be issued by the specified August 2 date Karzai had planned for inauguration of the new president. It’s hard to see how Kerry’s fantasy of a shared government will ever come to pass. Each candidate in the runoff will have strong grounds for declaring the results fraudulent should the other be declared the winner of the audit, and I think that is behind the impasse on developing an audit procedure. The argument can be made that there is no legitimate government in place since Karzai’s term has already expired, so there simply is no way to say who should be responsible for signing a BSA at this point. Back in December, the US openly floated the idea of working around Karzai to get someone else to sign the agreement. I’m thinking that plan is being dusted off again this week in Washington. Kerry and the rest of the Obama administration have already shown that they are quite willing to work outside Afghanistan’s constitution when it is in their interest (as demonstrated by the shared government plan). As noted above, Karzai’s term officially expired in May. I look for the US work-around of Afghanistan’s constitution to continue and for some sort of interim government to be declared once one or both of the candidates formally abandon(s) the audit process. You can bet that government will be headed by someone who will sign the BSA immediately. But remaining in Afghanistan likely also will suddenly require a lot more US troops since it also seems likely that violence will break out between supporters of Abdullah and Ghani rather than the two sharing the new government. I doubt Obama has the courage to simply walk away from Afghanistan, but in my opinion that still remains the best option for both the US and Afghanistan. Walking away is needed because it seems clear at this point that a US presence in Afghanistan serves only to make the situation worse. Did Obama’s Handling of Karzai When Visiting Kabul Put Bilateral Security Agreement at Risk? Demonstrating once again that electoral politics trumps all other considerations for his administration, Barack Obama mostly went along with the military’s recommendation (successful US political campaigns NEVER contradict the military) on troop levels in Afghanistan after this year, announcing a force size of 9800 after the military had requested 10,000 to 12,000 troops. Even the one instance of bucking military hawks comes from an electoral standpoint, as he announced that the force size will be cut in half after a year and then taken to only a handful by the end of 2016, which magically coincides with when Obama expects to triumphantly ride off into the sunset. Republicans are upset about an announced end to the troop presence, rather than allowing “conditions on the ground”, which is shorthand for letting the military do what it damn well pleases, to dictate force levels, but Obama seems to think that putting the end of our troop presence just before the next presidential election will get troops out at the one time electoral blowback will be minimized. President Hamid Karzai was praised by Afghans for rejecting the invitation by President Barack Obama to meet him in Bagram air base. A last-minute invitation was sent to President Karzai to come to Bagram air base as Obama arrived to Afghanistan on Sunday following an unannounced visit to meet with the US troops. Ashraf Ghani Ahmadzai, one of the other leading candidates, told Wall Street Journal in an interview that he wasn’t privy to the security discussions surrounding Mr. Obama’s visit. Some Afghans saw the episode as a deliberate snub and said the U.S. leader didn’t respect diplomatic protocol. Obama has set himself up for a huge problem here. It looks as though both Abdullah and Ghani are indicating that they expect to be treated with the respect due to the office of President. Should Obama continue his cavalier attitude of simply assuming the BSA will be signed once the winner is sworn into office, he could be in for a big surprise. At the end of that year, the force will shrink to the size of a regular armed forces assistance group, largely to handle military sales, under the authority of the U.S. ambassador. Even after our troops are gone, the US will do everything it can to keep enriching military contractors. https://www.emptywheel.net/wp-content/uploads/2016/07/Logo-Web.png 0 0 Jim White https://www.emptywheel.net/wp-content/uploads/2016/07/Logo-Web.png Jim White2014-05-28 09:17:422014-05-28 09:17:42Did Obama's Handling of Karzai When Visiting Kabul Put Bilateral Security Agreement at Risk?